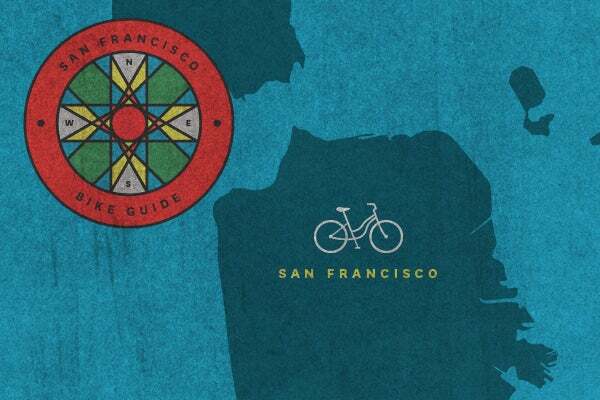 Just try to come between a San Franciscan and his or her two-wheeler — it won’t be pretty. Biking is a bona fide obsession here in the Bay and around practically every curve you'll find a speedy cyclist. And whether it's solving helmet-hair conundrums or selecting pedal-friendly footwear, we’re here for all you cycle-loving citizens. After all, we also get our kicks (and cardio) spinning around this hilly terrain. So, we’re delivering some spoke-n word on the best bicycle must-hits (broken down by S.F. neighborhood). If you’re looking for a cool new route or a spot to rest your hard head, this is it. After one glance at this great cheat sheet, you’ll be itching to hop on that sleek machine and fly around town. Let’s ride! It’s not hard to understand why Treat Street Bicycle receives such rave reviews. This tiny Mission spot handles repairs like nobody’s business. Whether you roll in with a clunker or have a top-of-the-line design, it doesn’t matter — your bike gets the same amount of TLC. Treat Street Bicycle Works, 3150 18th Street (between Folsom and Harrison streets), Mission; 415-551-2453. If you’re the kind of biker who knows exactly what they’re looking for, don’t gloss over Mission Bicycle. The Valencia Street shop specializes in custom-built bikes and has a staff chock-full of insider know-how. No bike snobs here! So, mosey on in, you’re sure to score the cycle of your dreams — made especially for you, by you. Mission Bicycle, 766 Valencia Street (between 18th and 19th streets), Mission; 415-683-6166. This Mission-based bike shop isn’t your average spokes and chains joint — nope, it also a non-profit and gives back to the bike-loving community. So, you know your moolah is going toward a good cause. Don’t come here and expect to find frills though, this place is straight-up cycling. With a great selection of used bikes, the budget-friendly outpost is the way to go for money-savers. Pedal Revolution, 3085 21st Street (between Shotwell Street and Van Ness Avenue), Mission; 415-641-1264. 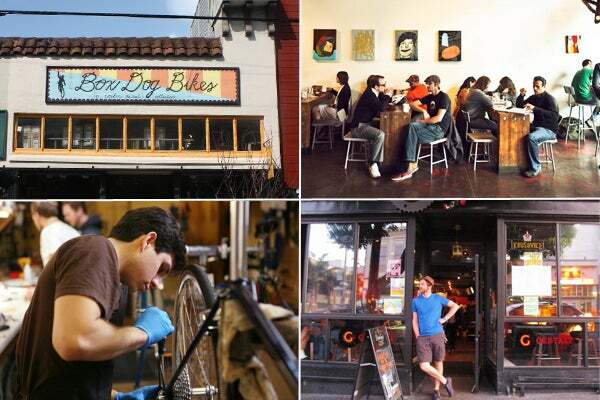 There is no shortage of bike shops in the Mission (not surprising), but another truly standout haven? Enter, Box Dog Bikes. It delivers when it comes to selection and service. With a bright, inviting storefront, stepping in for a tune-up, a totally new frame, or just to chat up the well-versed associates is guaranteed to be a good time. This place doesn’t skimp on the details. Box Dog Bikes, 494 14th Street (between Guerrero and Valencia streets), Mission; 415-431-9627. If vintage bikes are your cup of tea, Refried Cycles is a must-hit. The shop boasts sick, old-school cycles (that are relatively cheap), plus it does stellar in-house repairs, has oddball parts, and two ultra-adorable furry mascots. Cute pooches and pedals, need we say more? Refried Cycles, 3804 17th Street (between Prosper and Sanchez streets), Castro; 415-621-2911. If you’re on the hunt for a little more tech-centric cycle, The New Wheel has your back! This charming Bernal Heights shop is dedicated to delivering a luxe selection of electronic two-wheelers — it comes equipped with a charging station, too. Even if e-bikes aren’t your thing, it has offerings ranging from bike repairs to rentals. The New Wheel, 420 Courtland Avenue (between Wool and Bennington streets), Bernal Heights; 415-524-7362. Not only is this Noe Valley cycle shop convenient (with a location smack-dab on 24th), but it also sells a boatload of high-end performance bikes (Cannondale included), e-bikes, and more. Whether you are on the hunt for a shiny-new mode of transport or just browsing, be sure to swing by this rad spot. Noe Valley Cyclery, 4193 24th Street (between Castro and Diamond streets), Noe Valley; 415-647-0886. Before you begin a day of pedaling, get your caffeine fix at the ultimate bike-friendly roaster, Four Barrel. There are slews of cool racks, so it makes jamming in and out a breeze. You can sip on your cuppa Joe before speeding down the bike lane! Four Barrel Coffee, 375 Valencia Street (at 15th Street), Mission; 415-252-0800. Sure, this joint may be known as a biker (meaning motorcycle) bar, but it packs a punch when it comes to the pedals, too. If you’re feeling a wee-bit thirsty (for a bloody mary) and want to park it on a patio — and perhaps savor the Indian Summer sun — you’ve met your match. With a selection of custom-built bike racks inside and outside, you won’t regret making a pit-stop here. Gulp! Zeitgeist, 199 Valencia Street (at Duboce Avenue), Mission; 415-255-7505. 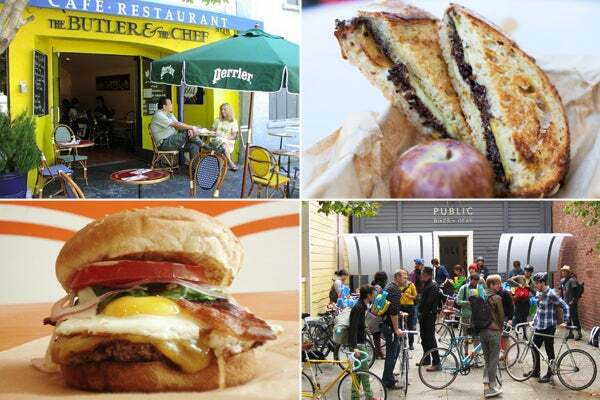 Heading up and down S.F.’s hilly terrain, you’re bound to work up an appetite. One of our top selects for a sammie that’s out of this world (tasty and satisfying), is Ike’s Place. Ike’s Place serves hearty lunchtime faves that are sure to keep you full after your commute. Plus, it’s an S.F. staple! We recommend going all out. Ike’s Place, 3489 16th Street (between Dehon and Sanchez streets), Castro; 415-553-6888. Equipped with an indoor bike rack, this bike-themed hole in the wall has been slinging cold ones to thirsty bikers for years and shows no signs of stopping now. Stroll in for a unique German brew or a glass of wine before (we kid!) …. after your jaunt. Getstalt Haus, 3159 16th Street (at Albion Street), Mission; 415-655-9935. This moderate 2.57-mile ride will send you through the Mission and land you in Golden Gate Park on the flattest route possible. See the map here. 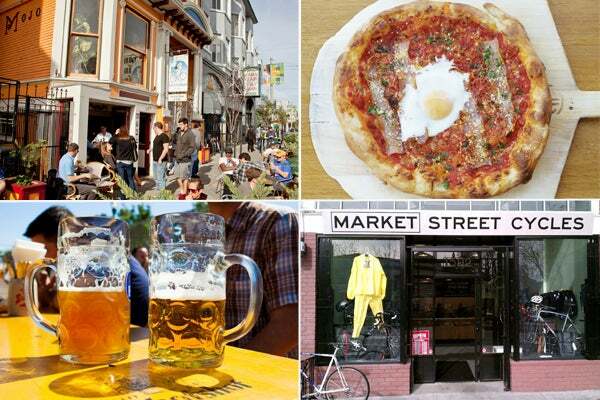 This 3.12-mile route loops you around the Castro, through Noe Valley, and up Dolores Heights. It's a quick little ride that we highly recommend for novices. See map here. Looking for a more intense route (19.31 miles) that shoots you clear across the city? Jam through the Wiggle, through Golden Gate Park, coast to Arguello Boulevard, and then on to the Presidio. See map here. Photos (clockwise from top left): Courtesy of Box Dog Bikes, Four Barrel, Box Dog Bikes, and Gestalt House. You don’t have to own a bright-hued PUBLIC bike to stroll into its rider-friendly South Beach locale, resting in the picturesque South Park. The shop uses its classic, Euro-style cyclers as both merchandise and art displays for our visual pleasure. And you can shop Public Bike's stock of awesome two-wheel accessories, from pet baskets and brass bells to a super-convenient wine carrier and custom graphic T’s. It's all encompassing! Public Bikes, 123 South Park Street (between Bryant and Brannan streets), South Beach; 415-896-0123. A two-wheel rider walking into Mike’s Bikes will undoubtedly feel like a kid in a candy store. The shop carries all sorts of cycles and gear, from urban riders and BMX tricksters to cruisers and mountain riding transports. Plus, its electronic section filled with nifty gadgets always has us nerding out. And, if you’re not one to break out your own toolbox, take your injured spokes over for a repair and get back to pedaling. Mikes Bikes, 1233 Howard Street (between 8th and 9th streets), SoMa; 415-241-2453. Consider Huckleberry Bicycles your go-to spot when your urban roadster needs some major TLC. Since it offers a wide selection of bike care, including new chain installs, bike-frame builds, and hub adjustments, there’s no need to travel around for various tweaks at different costs. Looking for a quick fix, instead? At Huckleberry’s repair kiosks, all spoke amendments come free. Huckleberry Bicycles, 1073 Market Street (at 7th Street), Downtown; 415-484-6575. Without the convenience of a four-doored hunk of steel harboring your gear, bikers have to find alternate forms of storing goods. That’s where Rickshaw Bagworks comes in. The store’s name derives from Japanese symbols translating to “human-powered machine,” and its bags are made specifically with urban bicyclists in mind. Head to the store to find everything from iPad carriers and laptop cases to messenger bags and slim backpacks for an easy commute. Rickshaw Bags, 904 22nd Street (at Minnesota Street), Dogpatch; 415-904-8368. If you’ve been zipping around all day, some refueling is in order. Thankfully, there’s American Grilled Cheese Kitchen, which caters to the commuter crowd and is situated within the rider’s grotto, South Park circle. So, if your stomach starts rumbling for the classic grilled-cheese sammies and smoky-tomato soup, just whip out your phone and order via its mobile ordering app. The American Grilled Cheese Kitchen, 1 South Park Avenue (at 2nd Street), South Beach; 415-243-0107. It can be a drag having to lockup your bike at every stop and then leaving it vulnerable out of the street. At newly developed Soma StrEat Food Park, you can walk your bike into the lot with you while grabbing a bite, to avoid any separation anxiety. Not to mention the always-revolving selection of grub trucks (including favorites like Garden Creamery, Kasa, and Bacon Bacon) is out of this world. Soma StrEat Food Park, 428 11th Street (at Harrison Street), SoMa; No phone. If we could choose to ride our bicycle anywhere on an empty stomach, it’d be straight to Super Duper Burger’s downtown haunt. We’re not the only ones: The resto is like a spoke-riders club come lunchtime. The juicy and savory burgers with mouth-watering toppings and malt shakes will give you enough of an energy boost to pedal up these steep hills, no matter your gear options. Super Duper Burger, 721 Market Street (between 3rd and 4th streets), Downtown; 415-538-3437. While we don’t condone drinking and riding, the Anchor Brewing Company is the ideal place to unwind after a day of intense cycling. And the mostly flat surrounding streets don’t complicate the path to achieving a buzz. All you have to do is unbuckle your helmet, settle in, and guzzle down a satisfying brew. Anchor Brewing Company,1705 Mariposa Street (at De Haro Street), Potrero Hill; 415-863-8350. So, you just finished jamming up and down the steepest of hills and need a place to chow? The Butler And The Chef in SoMa offers up cuisine that includes more than just burgers and sammies. Plus, it is in South Park so you can eat your food outside (if the weather provides). The French bistro isn’t just filling, but it also provides bikers with plenty of places to park it. It’s a cool, no-fuss post-ride meal. The Butler And The Chef, 155A South Park Street (at 3rd Street), South Beach; 415-896-2075 . Thought Lombard Street was the curviest in town? Nope, it actually is Potrero Hill's Vermont Street. A quick ride, perfect on a warm day, this path will take you down Vermont Street's twisty curve, over the 101, and across Potrero Avenue. See route here. This breezy bike route takes you through Potrero Hill, the design district, up Townsend Street, and spits you out at the The Embarcadero. See map here. This no-holds-barred route takes you through the entire city. But be warned: It is not for the faint of heart. Coming in at a staggering 38.27 miles, it's no walk, er, bike in the park. Start in the Dogpatch, through The Embarcadero, Fisherman's Wharf, Crissy Field, Ocean Beach, Golden Gate Park, Skyline Drive, and Twin Peaks. See map here. Photos (clockwise from top left): Courtesy of The Butler And The Chef, American Grilled Cheese Kitchen, Super Duper, and PUBLIC Bikes. Prowling for the perfect pedals? Fiending for a top-notch frame? North Beach-based Cykel will pair you with the best two-wheeled contraption. This boutique shop, selling high-end road, cyclocross TT, and Tri bikes (expert much? ), is known and praised for its matchmaking skills and down-to-earth customer service. But if you’re a sucker for dogs like us, their shop pup Zoe Dumplin’ Pearce is almost too much to handle. Cykel, 548 Union Street (between Jasper and Cadell places), North Beach; 415-374-7865. Stop by Bespoke Cycles and get legitimate bike support. This crew understands that confidence, comfort, and riding class come from a properly designed bike, so they work extra hard to tailor your cycle to a tee. Who doesn’t love a bespoke ... anything? Bespoke Cycles, 2843 Clay Street (between Divisadero and Scott streets), Pacific Heights; 415-642-5652. This is one club you want to join. There’s no denying that Rapha Cycle Club is one of the hottest stops for the biking set. We see why. This badass hub houses a gallery, shop, and cafe, making it the ultimate spot for both road racers and pedestrians looking to meet, learn, or chill out in a cool and cultured space. Rapha Cycle Club, 2198 Filbert Street (between Webster and Fillmore streets), Marina; 415-896-4671. If the past few shops were out of your cycling league, then Citizen Chain is your quintessential bike-shop-next-door! Inspired by Orson Welles’ Citizen Kane, this shop promises to connect riders with their youth and a bike to see them through their everyday journeys. Citizen Chain, 2064 Powell Street (at Chestnut Street), North Beach; 415-796-2925. Bike your buns on over to Bun Mee for a fast and tasty break. This Fillmore Street eatery has your appetite covered with a pork-belly sammie, sloppy bun, or crispy catfish. Eat and people watch alfresco on the cute tables out front or grab a banh to go and bike up to nearby Alta Plaza Park for some awesome city views. Bun Mee, 2015 Fillmore Street (between California and Pine streets), Pacific Heights; 415-800-7696. There is no doubt that riders will get their fair share of protein, carbs, and sunshine at this famous pizza joint. All the fuel you need, right? Fresh Italian toppings, a colorful parklet, and its prime location next to Washington Square Park make this the perfect pit-stop for refueling in the ever-famous North Beach. Tony's Pizza Napoletana, 1570 Stockton Street (between Union and Green streets), North Beach; 415-5835-9888. We’re strong believers in having our cake and eating it, too (especially after a long ride), so believe us when we say Chestnut Bakery is a bike babe’s well-deserved dessert heaven. Stroll in early for some fresh-baked French loaves, lunch on a cafe sandwich with a (free) cookie, or treat yourself to some top-tier tiramisu. The Chestnut Bakery, 2359 Chestnut Street (between Divisadero and Scott streets), Marina; 415-567-6777. Diverse bikers (and foodies) riding along the Embarcadero can get their mealtime fix sans the guilt at this sustainable café and restaurant. Sip on a smoothie or chow on the patio with a view of the Bay Bridge. Either way, this pit-stop is well worth the long ride along the San Francisco Bay Trail. The Plant Cafe, Pier 3, Suite 108, Embarcadero; 415-984-1973. If you’re in the mood for chill views all day, riding the S.F. Bay Trail alongside the eastern shore of the city is the bee’s knees. Your trek will start at Candlestick Park and be rewarded along the way until the end at Fort Mason. See map here. The journey starts and ends in the Marina, so it's up to you where you want to begin. This bit of the City Loop route will expose stellar views of the Presidio, Legion of Honor, Ocean Beach, Strawberry Hill, and Golden Gate Park. See map here. Ride through Fisherman's Wharf, along the Embarcadero, and through downtown for an easy, 2.8-mile ride to the Yerba Buena Gardens. This is definitely great for swift, city sight-seeing. See map here. 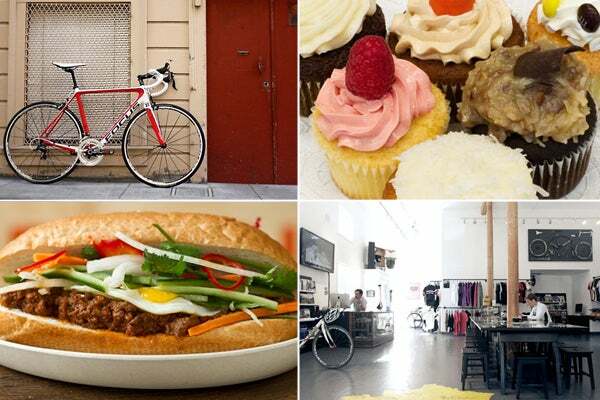 Photos (clockwise from top left); Courtesy of Cykel, Chestnut Bakery, Bun Mee, and Rapha. If you’re on a mission to get the whole city biking like Everybody Bikes, we suggest you join its ranks. The small, but full-service bike shop delivers cycles for all sorts of personalities and tasks, so we won’t be surprised if they achieve the dream goal ASAP. The shop is a local favorite that successfully converts and helps riders, one bike at a time. Everybody Bikes, 1352 Irving Street (between 14th and 15th avenues), Inner Sunset; 415-682-4439. If you’re a serious road-riding raven, pay some homage to the local nest known as The Bike Nook. Scour the walls of biking fame, shop the priceless inventory, and get riding repairs of a lifetime. This old-school shop knows its stuff … so leave your trendy bike statements at the door and listen up. The Bike Nook, 3004 Taraval Street (between 40th and 41st avenues), Outer Sunset; 415-731-3838. Bikes and beer go hand-in-hand in this city (if you couldn’t already tell) and San Francyclo serves that on a silver platter. The shop hosts not only repairs for all types of bikes, but also takes you on beer-guided tours fit for craft-brew royalty. San Francyclo, 746 Arguello Boulevard (at Golden Gate Avenue), Richmond; 415-831-8031. Grab your vintage ride and head over to DD Cycles for some real and rare care. This full-service shop serves as the neighborhood bike doctor, but specializes in two-wheelers that pre-date Elvis, unique or one-off builds, and hard-to-find or hand-made parts. DD Cycles, 4049 Balboa Street (between 41st and 42nd avenues), Richmond; 415-752-7980. If you love a well-themed and well-serviced cafe (we most certainly do), Velo Rouge Cafe is the place to park your pretty little two-wheeler after a ride in Golden Gate Park. This cycling haven boasts bike memorabilia up to the heavens, free wi-fi, and some awesome (and hefty) eats for cheap. Oh, and brunching here is a must! Velo Rouge Cafe, 798 Arguello Boulevard (between Cabrillo Street and Golden Gate Avenue), Inner Richmond; 415-752-7799. The healthy hut on Judah Street, dubbed Judahlicious, is known for its acai bowls, super smoothies, raw food, and vegan options. This mini-detour is just off the Great Highway and perfect for those warm and sunny bike trips along the Pacific coast. Judahlicious, 3906 Judah St (between 44th and 45th avenues), Outer Sunset; 415-752-7799. Looking to stir up some trouble on your bike route? Swing by Trouble Coffee Co. and treat yourself to some extra-strong sips and a cheese and bacon brioche (yes, please)! Nothing hits closer to a biker’s home than crave-worthy coffee, delicious carbs, and a day of cycling. Trouble Coffee Co., 4033 Judah Street (between 45th and 46th avenues); 415-682-4732. Tell us a place that has a Manchego cheese plate to-go, and we’re there! That’s why Acre Cafe nabs the attention of weekday bike commuters and lunch-goers alike. Not only does it sit pretty in the middle of the Presidio, but it feeds pretty, too. Organic goodness served at reasonable prices make this stop a divine one. Acre Cafe, 1013 Torney Avenue (between Bike Route 4 and General Kennedy Avenue); 415-561-2273. Whether you want to start or end your day with animals at the San Francisco Zoo or art at the Legion of Honor, the Great Highway will get there! It’s a 5.9-mile path that parades through Ocean Beach, Golden Gate Park, and the Lincoln Golf Course — it will not disappoint! See map here. Adventurous cyclists can head to the Presidio for bike routes and nature galore. On-road, off-road, multi-lane, you name it. If you want to hit more than one route, a loop around the entire park would be our suggestion. See map here. Photos (clockwise from top left): Courtesy of Velo Rogue Cafe, Everybody Bikes, and Trouble Coffee Co. Okay, so this Nopa bike destination is actually a twofer. It provides spoke equipment as well as treats for bike-conscious San Franciscans. Sit outside with a snack in hand as the excellent staff handles any repairs. Bike experts and newbies alike will relish in its awesomeness. Mojo Bicycle Café, 639 Divisadero Street (between Grove and Hayes streets), Nopa; 415-440-2338. Need some honest opinions about your bike? Roll into Market Street Cycle in Hayes Valley for the nitty-gritty on all things bike-related. They don’t beat around the bush when it comes to suggesting parts (that won’t break the bank) or services. With a cool atmosphere, great customer service, and high-quality selection, it ranks high on our cycle list. Market Street Cycles, 1592 Market Street (between Van Ness Avenue and United States Highway 101), Hayes Valley; 415-255-2453. Holy moly, bike mecca! Sure, this outpost may lean a bit on the pricier side, but don’t let that stop you. The staff won’t rest until you have found your ideal match, and delivers absolutely none of that pushy salesperson stuff. With ultra-rare to brand-spankin’ new, whatever your bike style is, this is the place to peruse. Plus, hit up American Cyclery Too (in Cole Valley), for more mountain bikes, hybrid bikes, and accessories galore. American Cyclery, 510 Frederick Street (between Arguello Blvd and Lincoln Way), Haight; 415-664-4545. This Hayes Valley shop is strictly bike-friendly accessories and has been in the game for over 20 years. These sleek carryalls are kind of an S.F. staple. But, you won’t just find bags here, stock up on blinky lights, hats, helmets, and other savvy must-haves. Timbuk2, 506 Hayes Street (between Octavia and Laguna streets), Hayes Valley; 415-252-9860. It’s like this place was made for biking citizens. Pedal on over, lock up, and scout around for a seat — you may be in for the long haul. But, it’s well worth the wait once you taste the brews. Quite the way to take the load off, and since we are officially entering the height of Indian Summer, hitting up this place is not even a question. Biergarten, 424 Octavia Street (between Linden and Fell streets), Hayes Valley; 415-252-9289. Why is it that pizza is so essential post-bike? Is it just us? There’s no better reward than grubbing at Ragazza after a lengthy loop around the city. Located in the Divis corridor, this slightly new eatery serves up thin-crust pizzas with a throw-an-egg-on-it mentality for hungry San Franciscans. Nom! Ragazza, 311 Divisadero Street (between Page and Oak streets), Lower Haight; 415-255-1133. Situated right up the street on Divis, near Mojo Bicycle Cafe, this chill spot has heaps of bike racks, outside seating, cheap beer, and tasty eats. A good mid-cycle stop, we recommend hitting it up, resting for a minute, and continuing your route, post-grub. Bean Bag Cafe, 601 Divisadero Street (between Grove and Hayes streets), Nopa; 415-563-3634. For a quick jaunt that really soaks in the sights of Hayes Valley, start at Patricia’s Green, zoom past the Painted Ladies in Alamo Square Park and the gothic houses on McAllister, then zip all the way to the breathtaking Conservatory of Flowers in Golden Gate Park. This 2.4-mile bike ride is a breeze! See map here. How could we wrap up our biking guide without an ode to Ocean Beach? Basically, a straight shot, this 5.3-mile route takes you through the Panhandle, Golden Gate Park, and spits you out at the Great Highway. See map here. Photos (clockwise from top left): Courtesy of Mojo Bicycle Cafe, Ragazza, Biergarten, and Market Street Cycles.